Sarah has giggled a few times, but this was her first sustained bout of laughter. Too cute. This is the video of Sarah's baptism from January 29th. She was a little bit hungry at the time. Can ya tell? Here's another video. We thought these smiles were too cute not to share. It's been a whirl-wind week. Can't chat long, so here are a few YouTube videos for ya'll. Yeah, I said it - YA'LL. 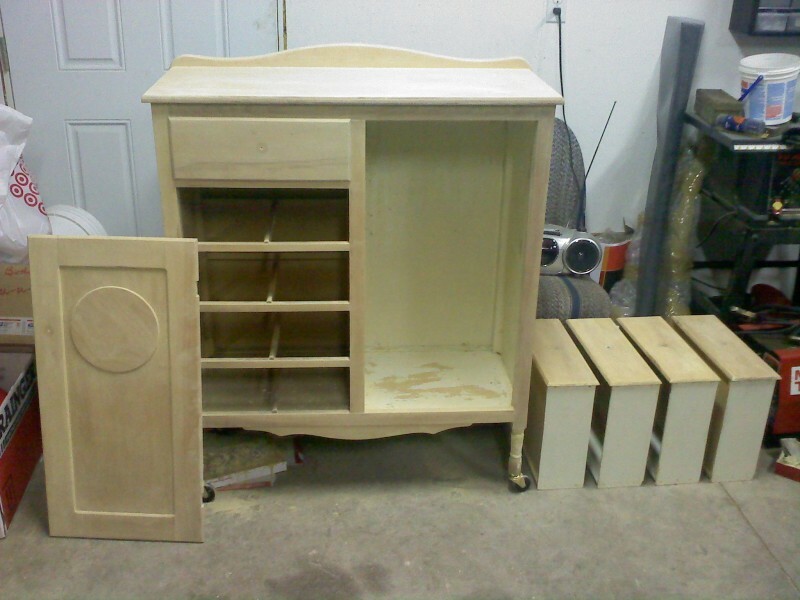 I've been working hard to get the baby dresser refinished. It's almost done - just need to sand the drawers, and stain/varnish the drawers and knobs. 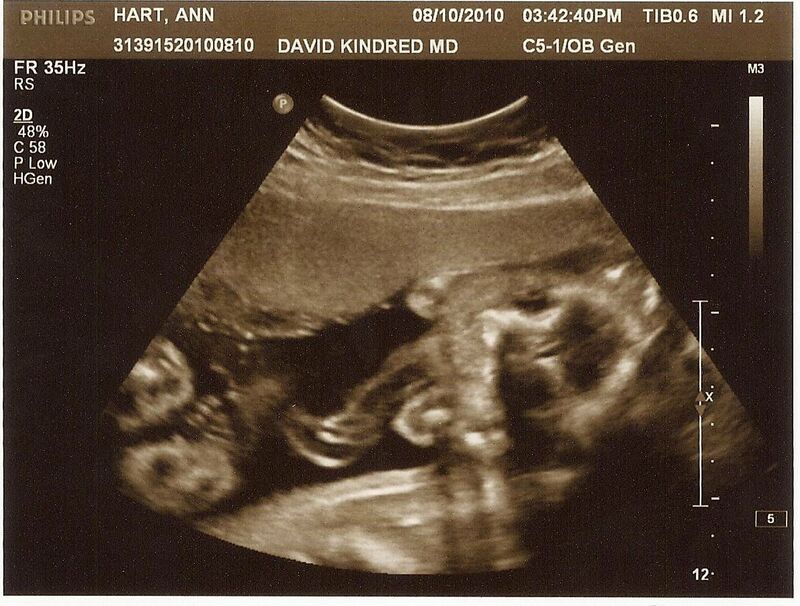 We had another sonogram at our appointment today. Both images are the same, except that the second one has some scribbles that should help you identify the body parts. According to the sono, the baby is currently 7lbs 3oz, which means an approximate birth weight of 8lbs 11oz. Definitely a full size baby. Ann is dialated to 1cm, which is a good sign that her body is getting ready. Everything is moving right along - almost too fast. Just had both baby showers. I'm working on getting this dresser refinished. It was Ann's mom's dresser when she was a baby. It has several layers of paint which we're stripping off. It will probably end up with a coat of light stain and some polyurethane. Thirty weeks and is well. Twenty-eight weeks and all is going well. And we have recently acquired a few new items, including a Pack & Play and a glider-rocker chair with ottoman. Joel and Rachel arrived yesterday and helped us paint the nursery (thanks guys!). What a difference some extra hands can make. The yellow and green look amazing and really help to brighten up the room. Now for the chair rail. We just registered at Target and Baby Depot (in Burlington Coat Factory). Also been working hard on getting the nursery ready - a little bit of drywall repair and some paint prep. We'll be painting this coming weekend with our friends Joel and Rachel. We've already received some gifts! Among other presents, the Doran's made us these cool booties. As a going-away gift, Ann's CG co-workers gave us a large gift bag with all sorts of goodies - shampoo, powder, diapers, books, etc. Thanks! We got sonogram pictures taken today. The still images don't do justice to what it's like to see the sonogram in motion. You'll have to use your imagination here. 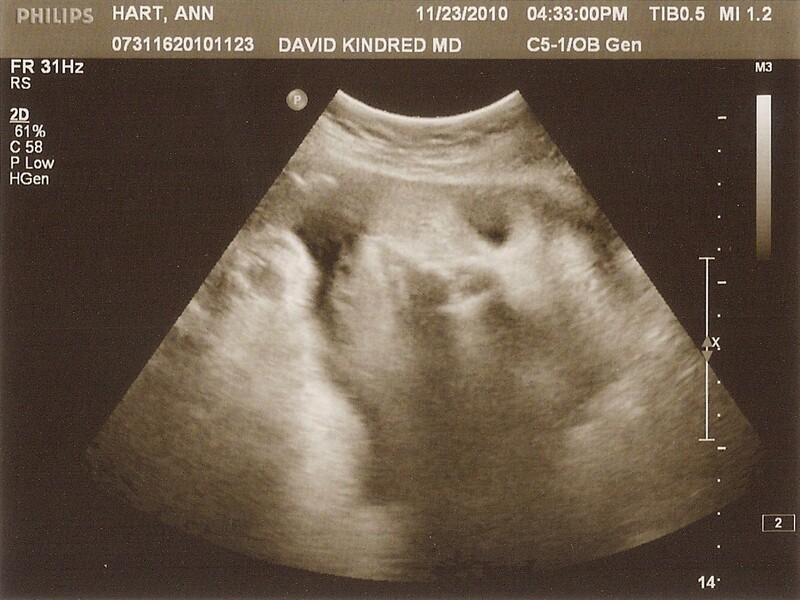 In the first image, the baby is laying down with his (or her) feet on the left and head on the right; arms are up around the face; between the feet and head you can see the umbilical cord. The second image is basically a shot of the feet. In the third image, the baby is once again laying down with the feet on the left and head on the right; in this one you can kinda see some details of the face - eyes, mouth. We're expecting our first child! 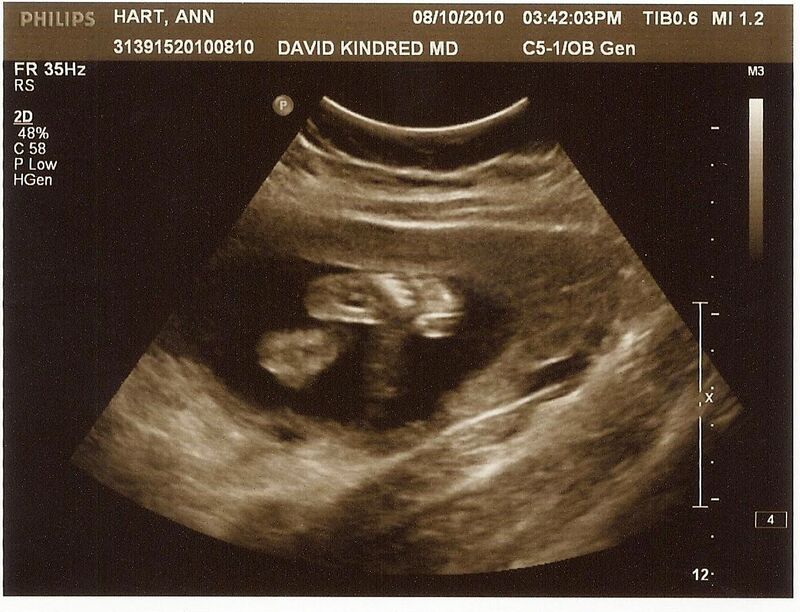 Baby Hart is due on December 17th. 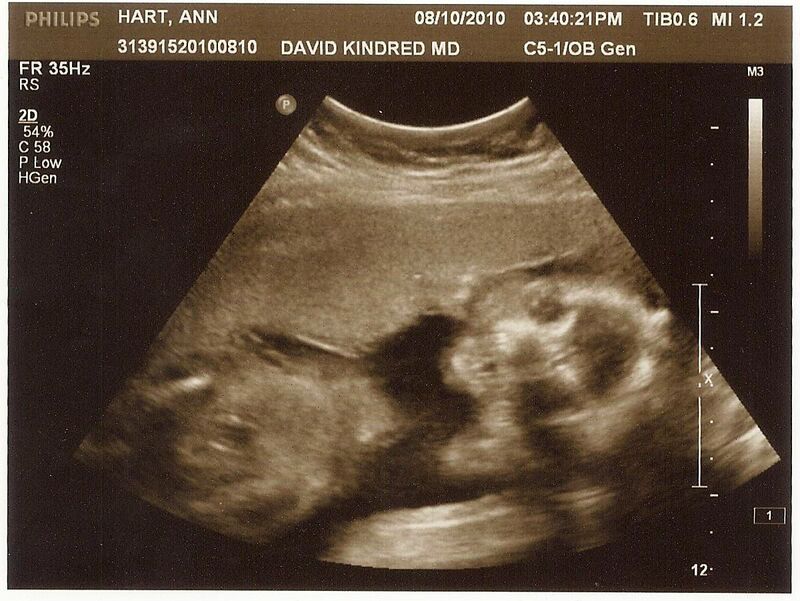 We won't be finding out the gender until the big day. It'll be a great surprise. We're super excited!